I’ve already waxed lyrical about the guys at tastytrade. The group provides a lot of interesting research and fun (online) TV for traders of all types. One of the more fun, and quality, bits of the show is ‘Where Do I Start’. The series takes host-man Tom’s daughter, Case, and teaches her to trade options from the very beginning. She has a small account, so they keep with small trades. Anyway, they’ve recently cut out the ‘fat’ of the episodes, to leave 3-minutes of good material for each topic. Worth study, if anyone is keen to learn options basics. Shark attack + lightning = MegaMillions? 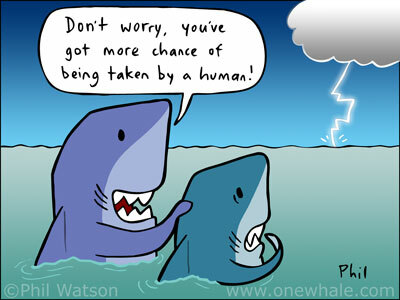 Source: http://www.onewhale.com via Google Images. Lotteries may not be so good for charity/education as one might think. The program focuses on the replacement of education funds by lottery money; sometimes the shifted state funds are used elsewhere, and sometimes they’re just wasted. OK, back on point. The program got me thinking about the humble lottery syndicate: suppose a group of 5 or so co-workers pool $1 each, on a weekly basis, to buy MegaMillions tickets. The jackpot would be shared equally. I’m sure many folks just do this as a way to build camaraderie, but there are indeed many people who honestly believe the lottery will help fund retirement. So let’s discuss a very slight improvement for this group of folks. (1/259 million) * ($105 million) – (1- 1/259 million) * ($1) = $(0.60). I expect to lose $0.60 of my $1 invested each week, on average. NB: I don’t include the other prizes, to simplify analysis. Take a look here for more rigorous computations. Strategy: purchase of deep out-of-the-money put options on the S&P500. Similar to lottery tickets, they will almost always expire worthless, but will sometimes have some value and very infrequently have a very large value. 2 days to expiry (DTE): 1795 strike. The S&P would need to ‘crash’ 12% over the next couple days for this to close in the money. I choose this one. 8 DTE: 1605 strike. A 20% crash needed. 16 DTE: 1450 strike. A 29% crash needed. Under most conditions, the 2 DTE 1795 put will expire worthless. The syndicate has lost its $5 this week. The probability of reaching 1795 in two days can be very roughly modelled as the probability of a 12% move given the S&P’s current 13% annualised volatility. That is a roughly 11-standard deviation move, meaning 0% probability given a normal distribution of returns. So conventional stats don’t really help us. So: out of 16,318 overlapping observations, we’ve found 3 that would result in a win for the nickel option. That’s a historical probability of 3/16318, or around 1 in 5,500. What do you win? That’s a good question. With only 3 observations where this has occurred, the expected move given the 12% loss is difficult to estimate. Just averaging the 3 gives -17.7%, or today’s S&P crashing to around 1678. Our option would then be worth $11,700 at expiration. Extension: what about volatility? If we are indeed down 17% on the S&P, we can’t expect implied volatility to remain 13% annualised. Though the VIX wasn’t around in 1987, estimates of implied volatility around Black Monday were about 170% annualised. Suppose we assumed we bought the nickel option today, then the crash happened; suppose further the volatility expanded to 170% annualised. Our option would now be worth about $17,500 with the extra vol. If we’re playing for this scenario, we might actually prefer the options with greater DTE…but I’m getting too complicated. Our expectancy, then: (1/5500) * ($11,700) – (1 – (1/5500)) * ($5) = $(2.87), or $(0.57) for each $1 invested. I expect to lose slightly less than the lottery. Lotteries are still terrible ways to make money. The expectation is horrible. Buying deep OTM options is also a pretty terrible way to make money. The expectation is nearly as bad. Statistics are fun when the numbers involved are ludicrous. I reckon almost every one of the stats mentioned above is dubious in one way or another. So fun for a thought experiment, but never for creating an actual investment strategy. How do I spend my day, while looking at screens of charts and computer code? Well, from around 1pm London time I’m watching tastytrade. Most of my trading is with equity and futures options; these guys spend all day talking researching and trading the same stuff. The banter between Tom and Tony keeps a smile on my face while banging my head against the wall due to programming frustration. Tom Sosnoff is the host; he made his $$ creating (IMO) the best options-trading platform there is: thinkorswim. Now he and his old trading buddy, Tony Batista, chat and present some great content in concert with an excellent supporting cast. Their new project is an option-trading platform for the millennial generation: dough. I can’t decide which I like better: the show when markets are down, or when they’re up. Tom seems to be a perma-bear, so this slow grind higher in basically every world stock market kills his mojo. The show definitely has a different tone depending on market direction. Use options-based strategies, to enhance probability of profit in a trade (e.g. buying a stock has a ~50% chance of profit, whereas going long a stock through options strategies can have a chance of profit just about anywhere you’d like). Trade small. Never let a position ‘own’ you, such that you must do one thing or another for a particular trade. Trade often. If you agree with number 1, choose high-probability trades. Then trade many times, such that the law of large numbers comes into effect. Then your expected probability usually comes out as good or better than expected. Manage winners. Again, from the previous points. It turns out (from research) that options strategies tend to make 0-50% of maximum profit in a fairly predictable and timely way, but the remaining 50% of maximum profit takes nerves of steel while holding positions to expiration. Forget the nerves, and close out winning trades at 50% of maximum profit. Duration over direction. Both in trade initiation and in managing losers, use positive theta to your advantage. Be paid for the passage of time (i.e. write premium in aggregate). If a trade goes against you, and you still believe in the trade, keep rolling the trade into the future until your ‘basis’ eventually catches up. Winning trades seem to last 1-20 days in tastytrade land; losing trades can last months and months. Anyway, glad to have them around for the banter.